Starting my four months in Nepal with a trek into the beautiful mountains of the Langtang region was a perfect way to settle into the country, find out more about some of its cultural traditions, be introduced to the hospitality of the local people, and get to know the rest of my group. We set out early from Kathmandu on the morning of our departure to begin the long drive up to Syabrubensi – the starting point for our eight day trek up to Kyanchen Gompa. Driving Nepal’s mountain roads (particularly when travelling in one of the local buses) is not an experience to be forgotten in a hurry, and could be called an adventure in itself. On the one hand, the views over the valleys are incredible, especially as you start to climb higher; on the other, the roads, at times, can be slightly terrifying – there were several moments along the way when our bus drove so close to the edge of the road, in order to let another vehicle pass, that we couldn’t quite believe how it had managed not to tumble into the steep valleys below (the sight of several bus wrecks halfway down the slopes were a vivid reminder of how easy it would be for things to go horribly wrong – although given the number of people who travel along the roads, the probability of something happening to us was probably quite small…). Partway through our drive up into the mountains, we stopped off at a roadside café for our first taste of an authentic Nepali staple – dhal baat tokari. This dish of lentil soup, rice and curry is eaten twice a day, every day by most Nepali people (and would be by us during our family stays too). 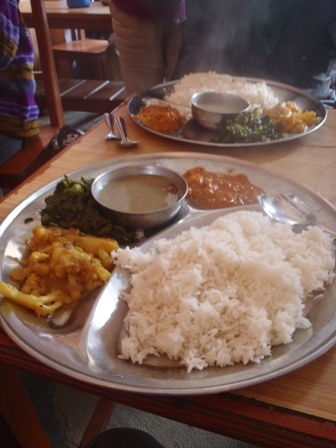 On this particular day, a plate piled high with steaming rice and a selection of curries (which could be refilled upon request) was a perfect warming and filling meal to sustain us on the journey, and I for one, fully enjoyed my first experience of a meal that I would become very familiar with. The trek itself was an unforgettable experience. As the days wore on, and we climbed higher into the mountains, the landscape changed from lush woodland, to open meadows, and finally to barren, rocky slopes, brought to life with vivid flashes of colour from fluttering prayer flags and the glinting white and gold of Buddhist stupas. Trekking at the end of January, the trails were practically empty, allowing us to enjoy the peace and tranquillity of the mountains, and meaning that we had most teahouses to ourselves each evening – perfect for huddling round the fire and exchanging stories. Reaching our final summit of the trek, and looking down over spectacular views of snow-clad mountain peaks, and winding glaciers, we really did feel on top of the world and, suddenly, shivering ourselves to sleep the previous night (I don’t think any of us were prepared for just how low temperatures could fall at this altitude) seemed very much worthwhile. 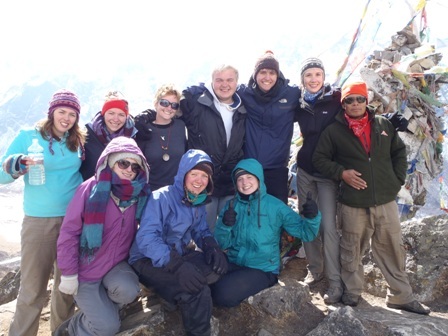 Click here to find out more about the Nepal teach and trek programme, or follow this link to find out more about the selection of Himalayan treks we offer.